As a young child my first experience with Sir Christopher Lee came with seeing him starring alongside Peter Cushing in 'THE HOUND OF THE BASKERVILLES' on an afternoon showing on BBC2. This effort from Hammer got me hooked and ever since then I have loved the Hammer Horror films. Go many years forward to me being older and seeing films that don't get mentioned much in his back catalogue ('THE VIRGIN OF NUREMBERG', 'FUNNY MAN') and my love of his later work in 'THE LORD OF THE RINGS' trilogy and 'STAR WARS' films, and you can see why he is a legend that will be sorely missed by film fans around the world. 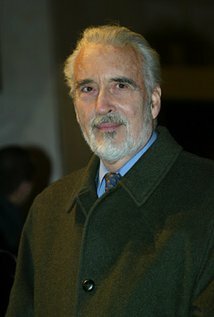 The last of the great, unreplaceable horror stars, Christopher Lee died over two decades later than his equally unique partners in crime, Vincent Price and Peter Cushing. The newspapers towed a predictable line with gag headlines pondering over whether he would rise from the grave and lots of lame Dracula-themed puns. Lee would not have been surprised by this narrow-minded vision of his incredibly long and varied career, and his true fans would have realised just how much more there was to his C.V. than the sexually magnetic, animalistic persona he brought to the Count. It’s worth noting that Lee was outstanding in a handful of disappointing films (I, MONSTER and TO THE DEVIL A DAUGHTER spring to mind), so this list restricts itself to ten very good or tremendous movies in which he also happened to be very, very good. It is by no means definitive, but, if you’re looking for at least a strong start to a domestic Christopher Lee tribute season, it will serve you well. CURSE OF FRANKENSTEIN (1957) : Lee’s simultaneously pitiful and grotesque take on the Frankenstein creature – just as worthy an interpretation as the iconic Karloff take – is a masterclass of mime. DRACULA (1958): Terence Fisher’s brilliantly pared-down adaptation of the Bram Stoker classic has an extraordinary power in the few minutes in which Lee’s mesmerising Count is on-screen; a ferociously good and unmatched performance. The climactic battle between him and the exuberant, table-jumping Van Helsing (Peter Cushing) is an action highlight of both their careers. THE MUMMY (1959): Outstripping his Mummy predecessors in terms of sheer menace, the third of Terence Fisher’s classic monster rallies is highlighted by Lee’s most physically imposing performance. DR. TERROR’S HOUSE OF HORRORS (1965): Lee plays on his widely known “pompous” persona to wonderful effect as the snide, mean-spirited art critic who spends the whole movie bitching about tarot-reading Peter Cushing and gets his just desserts in the Amicus anthology tradition following a campaign of cruelty against artist Michael Gough. THE DEVIL RIDES OUT (1968): As the charming and saintly Duc Du Richleau, Lee fulfils a rare heroic role for Hammer with typical presence and charisma as he is pitted against Charles Gray’s nefarious Mocata in one of the studio’s most potent occult chillers. THE HOUSE THAT DRIPPED BLOOD (1970): A multi-faceted portrayal from Lee in the “Sweets to the Sweet” episode of this fine anthology. As the plot evolves, his seemingly oppressive patriarch is revealed to be the victim of the story, not the one to be afraid of. Lee subtly and cleverly peels away the layers of his strict, authoritarian presence to reveal vulnerability and sheer terror of his offspring. THE CREEPING FLESH (1972): Lee is the real villain of this marvellous end-of-an-era British horror flick, an asylum proprietor refusing to accept his half-brother Cushing’s seemingly insane burblings of an ancient skeleton’s unique properties. One of the last great Cushing-Lee teamings, though the equally lively and inventive HORROR EXPRESS the same year is just as worthy of a re-watch. THE WICKER MAN (1973): One of the many great things about THE WICKER MAN- which starts like a culture-clash musical and ends with a mind-scarring shock – is the way in which it recasts previously malevolent Hammer actors: Ingrid Pitt plays a librarian while Lee wears purple dresses and sings! Reflecting the film’s tonal shifts, Lee’s initially charming presence foreshadows much darker things to come: “You’ll never understand the meaning of sacrifice” he notes with subtle malevolence at a relatively early stage of the movie. Lee admired it greatly, and it is arguably the strongest showcase of the actor’s versatility within the horror bracket. 8. The Lord Of The Rings Trilogy. 10. The Curse Of Frankenstein. With a career spanning over 70 years,Christopher Lee starred in a variety of genres,actively working until his tragic passing recently.This is a very personal top twenty of my favourite films of Mr Lee,which highlights his remarkable versitality and breadth of talents. THE WICKERMAN (1973) ROBIN HARDY. Lord Smmerisle. HORROR EXPRESS (1972) EUGENIO MARTINO.Sir Alexander Saxton. THE WHIP AND THE BODY (1963) MARIO BAVA.Kurt Menliff. THE BLOODY JUDGE (1970) JESUS FRANCO.Judge Jeffries. CASTLE OF THE LIVING DEAD (1964) LUCIANO RICCI.Count Drago. THE MAN WITH THE GOLDEN GUN (1974).GUY HAMILTON.Scaramanga. THE MUMMY (1959) TERENCE FISHER.Kharis/The Mummy. RASPUTIN THE MAD MONK (1966).DON SHARP.Rasputin. THE THREE MUSKETEERS (1973).RICHARD LESTER.Rochefort. DRACULA,PRINCE OF DARKNESS (1966).TERENCE FISHER.Dracula. THE CURSE OF FRANKENSTEIN (1957) .TERENCE FISHER.The Creature. DRACULA HAS RISEN FROM THE GRAVE (1968).FREDDIE FRANCIS.Dracula. THE CITY OF THE DEAD (1960).JOHN LLEWELLYN MOXEY.Alan Driscoll. JINNAH (1998) JAMIL DEHLAVI.Mohammed Ali Jinnah. THE DEVIL RIDES OUT (1968).TERENCE FISHER.Duc de Richleau. THE HOUND OF THE BASKERVILLES (1959).TERENCE FISHER.Sir Henry Baskerville. THE HOUSE OF LONG SHADOWS (1983).PETE WALKER.Corrigan. BRIDES OF FU MANCHU (1966).DON SHARP.Dr Fu Manchu.